The Secretary of the Treasury, a post first held by Alexander Hamilton, is fifth in the presidential line of succession. 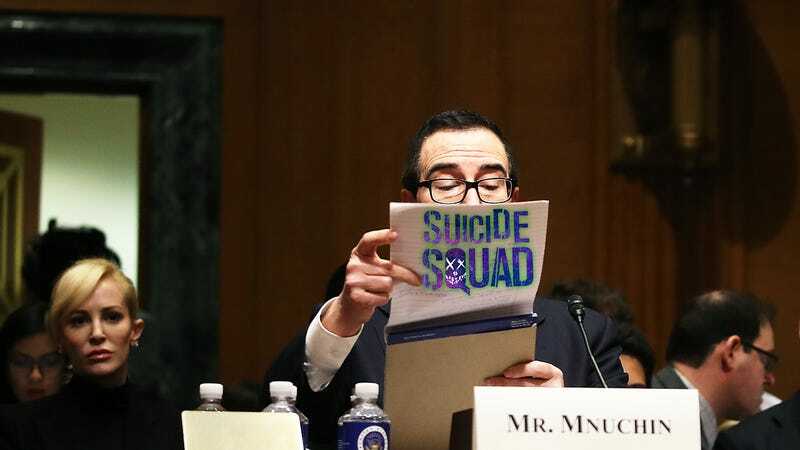 52 Republican senators and a lone democrat, West Virginia Senator Joe Manchin, voted in favor of Mnuchin, a former Goldman Sachs executive who also is the executive producer of Batman v Superman: The Dawn of Justice. Mnuchin, along with two other partners, also happens to run RatPac-Dune Entertainment, which made a $300 million venture loan deal with Warner Brothers. Thanks his cash, the world got to see gems like Suicide Squad, Batman v Superman and the Entourage movie, which respectively have a 26%, 27% and 33% rating on Rotten Tomatoes. To be fair, he also put his money behind beloved movies like Mad Max: Fury Road and The Lego Movie.